Just in the door from a visit to the wholesaler and now have two more fabulous Gellux gel polish colours in. Pink Violets and chocca mocha. I can't wait to try them out on my client's nails in Norwich. I have also purchased the 'easy off base coat' from Gellux. This product is so good that it can last up to one month on some clients and harder to remove on them. On average it's 15 days no chip or peel, so will be good to see how this new product from salon System works out. I will keep you updated. 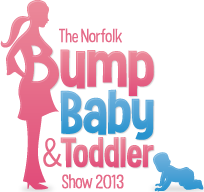 Handing in my booking form tonight for the Baby, Bump and Toddler show. It is held at the UEA and was fab last year. Lucy Stone director of Events in the east is an amazing event organiser, so really looking forward to what she has planned next year. Over 80 stalls expected. Looking forward to seeing from familiar faces like Jess Wilkins photography , merry-go-round , Jenni Grant Reflexology , sticky prints , Waterbabies , Norwich sling library and Tina from precious patchwork . Also taster sessions from tinytalks , Jo jingles , mini monkey , gymboree and mad academy . I will be offering gel polishes on the day and OPI file & paint. I will also bring my cotton for some eyebrow threading. Test patches for eyelash extensions will be available too. Earlier this month I had a fab time at the annual ladies pamper and burlesque evening at St Andrews Hall in Norwich. I offered OPI file/ paints and Gellux gel polish nails. I love attending stalls like this. Meet some lovely ladies. Huge variety of different stalls selling handbags, purses, jewellery, new & secondhand clothes, holistic therapy, make-up, candles, perfume and cosmetics. This event was organised by the Kindi Tembo who can be found on facebook under Kinder surprize Events . Check out these fabulous express lashes art I did with silver beads. These are done using individual lash extensions on your own eyelashes not lids. They are completely lightweight and look amazing when you blink. Adds a bit of magic which will catch every ones attention. It's takes 20 mins to do this beauty treatment at my Norwich beauty salon or can be done at a pamper party. Ideal for hen do, birthday and other special occasions. Test patch is required for this treatment. What other type of lash art would you like to see? Crystals? feathers? coloured? glitter? Hi everyone. I am getting some ideas together for Christmas nail art. I can do these in OPI polish or Gellux gel polish, which last 15 days no chip or peel and you go home with dry nails. Sets under UV light. I would love some input into what nail art you would like to see next at my little salon in Norwich. So please feel free to leave me a comment! There are also some Halloween and everyday art on there too. Plus some different styles for French if you have a wedding coming up. Been an exciting couple of months. I am now coming to the end of my business course and gained lots of new friendships and skills. I can't wait to start putting some things into practice. Henna and eyelash extensions have really taken off and fast becoming my favourite treatments. I love the looks on my clients faces when they look in the mirror for the first time with the lash extensions and the creativeness that henna gives me. 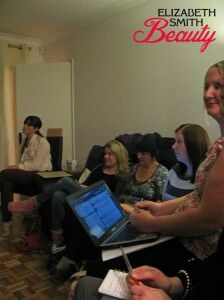 Lots of positive feed back & repeat bookings for pamper parties. Such good fun and such a great way of getting your friends together for the night. 'Pick from the menu on the night' is perfect to suit everyone's budget. On a personal note. Me and Jessica had a fabulous time in Holland for a long weekend. Jessica was an angel on the flight giggling and pointing out the window. Spent some well deserved Mummy and daughter time together at the zoo. Where every animal was a dog! Booked up to go to Centreparcs for the first time in December. Really excited about some time to relax. It’s getting colder outside. Do you have the autumn blues? 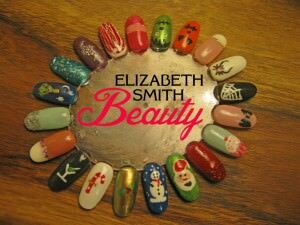 Why not book yourself in for a treat at Elizabeth Smith Beauty. The semi-permanent eyelash extensions are a huge hit at the moment. They are individually bonded to each eyelash. Check out the albums on my facebook for some of the recent applications. Perhaps have a Gellux manicure that lasts on average of up to 15 days no chip or peel. Lots of fab colours and nail art in. I am getting booked up for Christmas pamper parties. So instead of buying your girlfriends presents this year why not host a pamper party with mulled wine, relaxing music and good company. 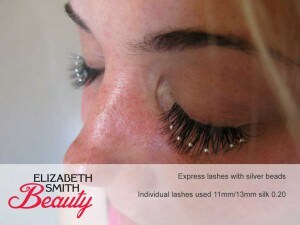 How does express lashes with sparkles sound with a warm relaxing facial? Remember to keep up to date with latest offers and treatments by following me on facebook.